While the global passenger seat market will grow with an average 5% per year, Recaro Aircraft Seating expects a spike in demand for business class seats in particular. A trend further fueled by passengers’ expectations for airliners to deliver ‘individualized living spaces’ onboard. To be fully ready to answer market needs, Recaro has invested heavily in its R&D for business class seats. For most airlines, business class seating has become the signature product for their passengers as it offers most possibilities to reflect the airline brand. Integrating innovative features in business class also helps them differentiate from the competition. At the same time passengers expect carriers to deliver individualized comfort in the sky, especially when it comes to business class. This has led to an increase in appreciation for business class seats. As a supplier of premium aircraft seats for airlines and OEMs, Recaro has identified the evolutions in business class and in the aircraft seating market in general for the years to come. There will be a further decline in the number of first class seats in the foreseeable future: few airlines still offer first class, and when they do they tend to go for a superior first class-product with limited availability. Recaro also sees a rise in demand for a wider range of business class seats. Similar to economy plus and premium economy being available next to regular economy, business class will have different category seats offering more or fewer features. The evolution towards more business class will have an effect on the business class seats themselves: since airlines have started to eliminate first class from their long-range fleet, business class has become an even bigger differentiator than it already was. Carriers expect a highly individualized product with a premium look and feel. 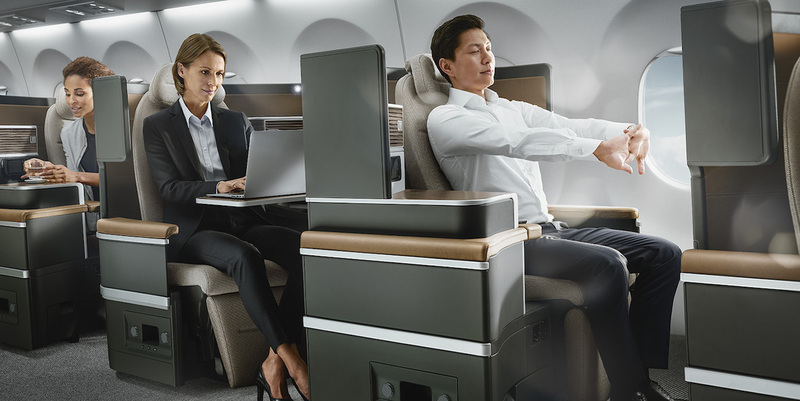 Privacy, connectivity and interactivity, comfort and wellbeing as well as an individually adjustable seating environment equipped with personal air-conditioning and a mini-bar will become the new normal in business class. Passengers expect their own individual living space in the sky and that is what they will get. Five-star carriers strive to be ahead of their competition by bringing innovations to the aircraft cabin. As such, these airlines expect tailor-made ‘bespoke’ products for all their seats. Carriers with smaller fleets, on the other hand, often do not have the means to bear the costs nor the resources to go through an entire product development process. They prefer to go with a mature and/or off-the-shelf platform product, that has proven to be successful with one of the five-star carriers, enhanced with customized features. Business class moving up to replace first class seats, widens the gap with the economy class seats and increases the need for an intermediate economy segment. Over recent years Recaro has seen a higher demand for premium economy seats. We foresee this trend continuing in the years to come.